Holds 30 napkins and 27 tampons of specified sizes. Doors are held closed with two (2) tumbler locks. Internal coin-box is keyed differently than door locks. 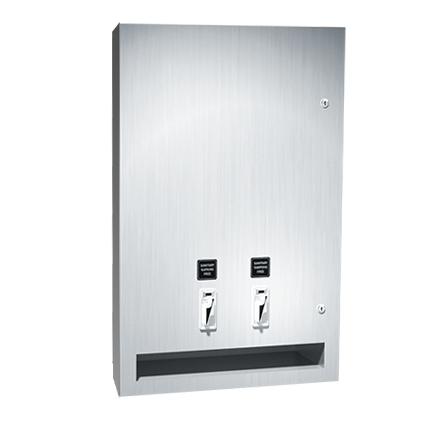 Dispensing mechanisms are fastener mounted internally to provide ability to change mechanisms for coinage denomination. Weights for each feed track are supplied. Unit supplied with SR collar to convert to semi-recessed mounting.